Using a handicap shower bench will help those who have trouble with hygiene because of some disability or limited mobility issues. One can safely take a shower without feeling tired. Slipping and falling is among the biggest fears the elderly have. A slip can fall can result in broken bones that have become frail over the years. In most cases, these unfortunate breaks will require surgery and extensive rehabilitation. Avoiding slips and falls is easier when the correct equipment is being used. Of all the places a slip and fall can occur; the bathroom shower is among the highest risk. The best way to avoid slipping and falling in the shower is by utilizing a handicap shower bench. A person does not need to be handicapped by definition to use one. Anyone who has issues standing for any length of time or finds the use of a shower bench just more comfortable, it is a simple solution for these reasons. In addition, keeping up on hygiene is important for anybody but particularly important for the elderly as they are more susceptible to infections and disease. Being able to take a shower independently is also important, for self esteem as well as being able to maintain independence, in the mindset of the elderly. Because handicap shower benches are available in a variety of shapes, sizes, heights and installation choices, finding the right handicap shower bench is quite easy. The price for the most basic of handicap shower chairs will run about $25 with more elaborate chairs running into the hundreds of dollars. Shower benches are made from many materials ranging from plastic to wood, all capable doing the intended job. For a smaller piece of furniture in your shower stall, consider shower stools. They also come in various materials like teak or plastic. 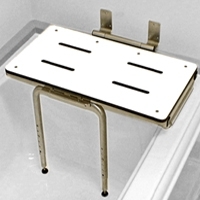 No matter what they are made from, using a properly installed handicap shower bench improves bathroom safety allowing the elderly to maintain the integrity of an independent lifestyle without relying on assistance. These small measures are what create a safe and relaxed environment for the elderly and handicapped to remain independent in their shower.